It wasn't a phone call that Roger Deakins had ever expected to receive. This acclaimed English cinematographer -- best known for his Oscar-nominated work for the Coen brothers and Sam Mendes -- had strictly been working the live-action side of the street. But when Pixar Animation Studios reached out in 2005 and asked him to come consult on a project that they then had in development, Deakins had to admit that he was intrigued. 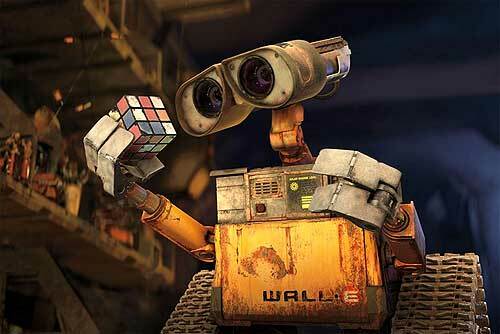 "They were just getting started on WALL•E," Roger recalled during a recent phone call. "And Andrew Stanton, the director of that animated feature, had asked Pixar to bring me in because he wanted this movie to look different from everything that this studio had previously produced." You see, because WALL•E was supposedly set in mankind's future, Stanton wanted this animated feature to look more like a conventional motion picture. For lack of a better term, he wanted the first act of this film to look realer than any of Pixar's prior pictures. And Andrew thought that Roger might just be the guy who could then teach the folks working at that animation studio the sorts of lighting styles and camera movements that would make WALL•E's opening scenes look more like live-action cinematography. So Deakins went up to Emeryville for what he thought would be a relatively short stint. Give the people at Pixar a quick master class on the principles of live-action cinematography and then return to the allegedly real world of Hollywood. Where -- at that time -- Roger had just begun talking with Joel and Ethan Coen about what his director-of-photography duties on their next production, No Country for Old Men, might entail. But what was originally supposed to have been a quick turnaround trip gradually turned into this two-week long stay in Emeryville. As Stanton and his WALL•E team repeatedly picked Deakins' brain for ways that they could then make the first act of this futuristic fantasy look more like a live-action film. "And in WALL•E's introductory scenes, what helped sell the idea that this Pixar film was actually set in the real world was cutting back on the number of lights that they were using to light these scenes," Roger explained. "The real world, the natural world that we live in just isn't as well-lit as your typical animated world is. There are shadows here. Areas in half-light over there. And if you can take that into account as you're planning your camera movements on a CG production, make those sorts of necessary adjustments to light levels as you're composing your shots, you'll then wind up with scenes that look much more naturalistic when they're up there on the big screen." And while Deakins is quick to play down whatever small role he played in WALL•E's eventual enormous box office success ("Seriously. I only consulted on a few shots for the first 20 minutes of that film," Roger protested. "It's Andrew and his team who really deserve the lion's share of the credit here"), his creative contribution did not go unnoticed by others in the animation industry. For the next thing Deakins knew, DreamWorks Animation was reaching out. Asking him to come take a look at How to Train Your Dragon. "Having seen the way that I helped out with on WALL•E, Chris Sanders and Dean DeBlois wanted me to come consult on their movie. Help them find ways to use natural light and shadow to make the world that Dragon is set in seem that much more believable," Deakins stated. "I wound up working on that film for over a year. I was much more hands-on with Dragon than I had been with WALL•E. I had my own dedicated website where -- whether I was back home in England or off on location working on one of my live-action assignments -- I could still connect with DreamWorks and offer up any thoughts or suggestions I might have about the scenes that Chris and Dean were working on at that time." Roger's finessing of this film's visuals can be seen and felt all throughout How to Train Your Dragon. From the way that the Viking village of Berk looks when it's lit only by torchlight to the soft mist and shadow which fills the forest where Hiccup goes off to search of that fallen Night Fury, Deakins' creative suggestions brought so much to the look and feel of that movie. Particularly when it came to the proper lighting and camera placement on this animated feature's flying sequences. "With CG, it's often easy to do something that's impossible in the real world. But the only problem with doing impossible things is that it then give your audience an excuse to disengage from your movie," Roger explained. "So when it came to Dragon's flying scenes, what I told Chris and Dean is that they should avoid having Hiccup and Toothless do truly impossible things. Give this film's aerial sequences some sort of grounding in reality." And DreamWorks Animation must have clearly thought highly of the creative contributions that Roger made on 'Dragons.' For they then began bringing him in earlier and earlier to work as a visual consultant on the other films DWA had in development. For Rise of the Guardians, Deakins provided photographic reference for the color keys that were used throughout this fantasy-adventure. He also gave director Peter Ramsey extensive notes on issues like depth of field and light intensity. "That's the sort of stuff that I got to do on Guardians. When I wasn't working on Skyfall, I mean. But each of these DreamWorks Animation productions have their own unique sets of challenges," Roger continued. 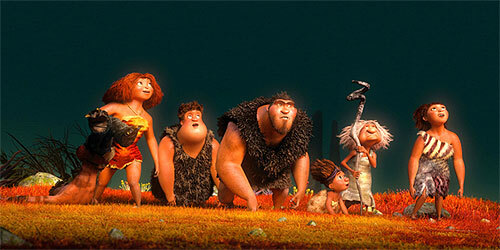 "On The Croods, Chris Sanders and Kirk DeMicco wanted this comedy-adventure to have almost a documentary look to it. So that the audience would then feel like that this prehistoric family was in real peril and then begin to root for them as this family made its way across a landscape that's in constant upheaval. And in order to successfully pull off that documentary-like look ... Well, you can't be afraid of blown-out, harsh lighting. You have to jump in with both feet and really commit to a look like that." And clearly The Croods' very different look didn't have an adverse impact on its worldwide ticket sales. To date, this prehistoric adventure-comedy has earned $533.8 million. Which is why DreamWorks Animation has already tasked Chris and Kirk with coming up with a possible storyline for a Croods sequel. And -- at some point in the future -- DWA will no doubt be roping Roger in again. Asking this accomplished cinematographer to please come in and consult on the visuals for Croods 2. Just as he's working now with Dean DeBlois on How to Train Your Dragon 2 (which will be released to theaters in June of 2014). Mind you, Deakins is doing all this visual consulting working while soldiering on with his still-quite-active live-action director-of-photography career. In fact, before I could get Deakins on the phone last month to talk about all of the animation consulting work that he'd been doing, I had to wait for Roger to finish up with his day job. Which -- at that time -- was director-of-photography on Prisoners, that Hugh Jackman / Jake Gyllenhaal movie which has been shooting in and around Atlanta for the past few months. "This is kind of an interesting side-gig that I've got going. Being the guy that people bring in whenever they're trying to make the animated film that they're working on look like live-action," Deakins laughed. "That's what Gore Verbinski did when he hired me to be his cinematography consultant on Rango. And let me tell you: Getting the shadows in that film's saloon scenes to look just right plus the hard, harsh light in the desert scenes was tough." But even so, Roger welcomes the challenges he faced in these CG assignments. If only because this 10 time Academy Award-nominee feels that the lessons that he's learned while working as a visual consultant on all these animated features has given Deakins a unique perspective on what's been going on in Hollywood over the past 10-15 years. "I mean, look at The Hobbit. How exactly do you classify a film like that? It's a live-action production that has got more CG in it than a lot of animated features that I've done consulting work on," Roger concluded. "We're working in this age when the lines between what a live-action film is and what an animated feature is has basically been blurred. And given that I'm something of a purist -- I prefer working with film over digital cinematography. And I'd love to be able to shoot a film in black and white -- I sometimes wonder if that's actually a good thing." Which is kind of ironic. Given all the work that Roger Deakins has put in to help blur the line between live-action and animated features. Jim is currently working on a behind-the-scene history of the development and construction of Disneyland. For his more immediate musings on movies, TV shows, books and theme parks, please check out his blog, jimhillmedia.com.